For most Canadians the Victoria Day (or May) long weekend heralds the start of summer. Everywhere people gather up the water skis and bathing suits and head out to campgrounds and cottages. Here, it is a little different albeit no less anticipated. We take to our snowmobiles and head out on the land to dig through seven or eight feet of ice and go ice fishing. It is not usually what springs to mind when people think of summer. 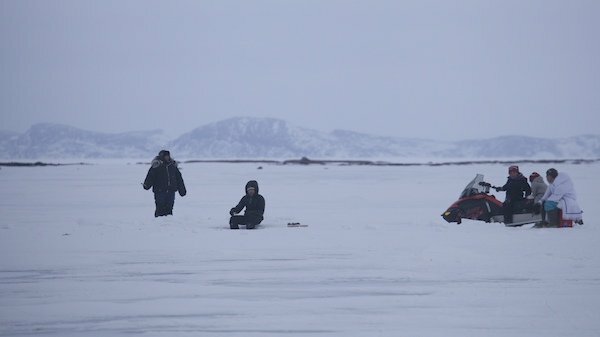 Pretty much the whole of Arctic Bay empties for the weekend, as most people head out to one of four lakes or rivers that form part of the annual fishing derby. They range from about an hour and a half to nine hours away by snowmobile. We chose a place called Ijjijuarjuq, about midway down. 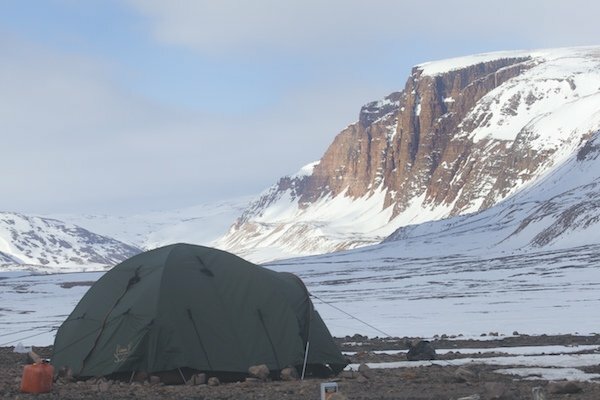 I’m not much of a fisher these days, so my plan was to auger holes repeatedly through the thick ice, cook, and explore the spectacular valley framed by towering cliffs on both sides. Its really not yet spring here, in terms of birds, that won’t happen for another two or three weeks. But I had hoped to see what may be around, holding out hope that an early Peregrine Falcon would be staking out an aerie in the cliffs. The valley opens up at the ocean to a wide flat delta with a lake in it, and when the explosion of returning bird life happens soon it would be a very busy place. Littered with goose droppings there is little doubt that many Snow Geese nest there, and the gravely delta is an ideal place for Semipalmated and Common Ringed Plovers. But for now, there were only the occasional Raven passing over, and several Glaucous Gulls making themselves at home. It wasn’t a very birdy weekend, but then I didn’t expect it to be. Fishing. The far shore of Moffit Inlet can be seen, miles away. It was, however, a bird that led me to one of those serendipitous moments, that I may otherwise had missed. I was out on the ice, enjoying tea with Leah, when we heard the unmistakable rattle of a male ptarmigan in its display flight. 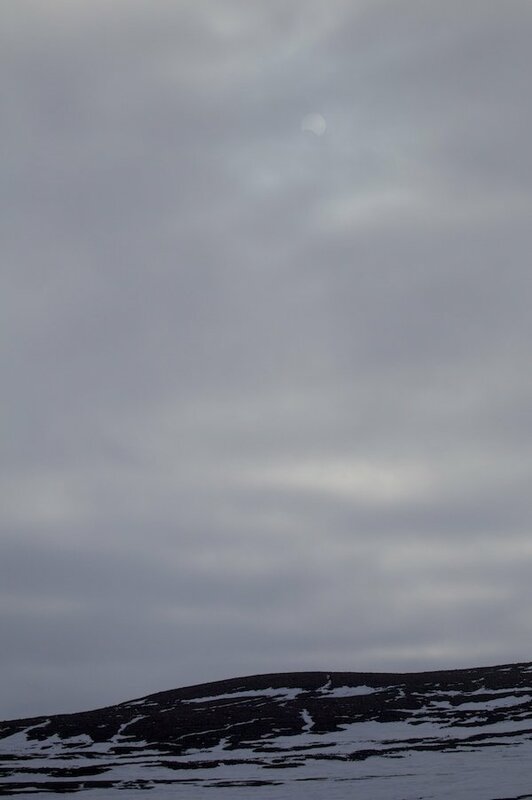 We looked up and saw the bird drop right into our camp, which was on a small, bare island in the frozen lake. I almost immediately began hoofing over to get my camera out of the tent. But it was heavily overcast and just after midnight, so the shots were poor, and I took one too many steps towards the nervous bird trying to get a better one. I watched it disappear, flying low, into the valley. But I was determined to find it, or more Rock Ptarmigan, the next day. I’d walk up into the valley to find them. When the time came, the following evening, I set off camera in hand towards the nearest hills, the spot where the ptarmigan had disappeared. I was still crossing the lake when the Sun became just visible through a thinning in the clouds. And as I hadn’t seen much of it since leaving Arctic Bay I glanced towards it, and did a double take. 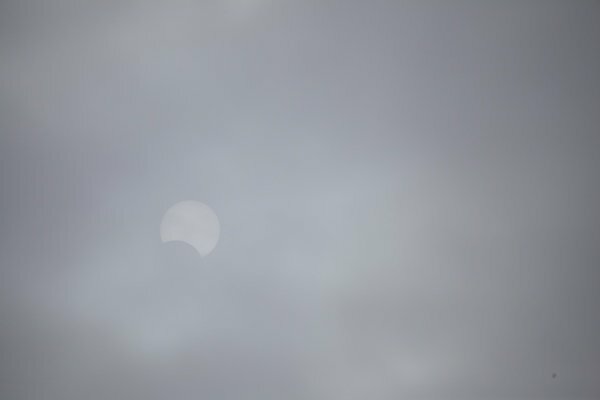 There was the partial eclipse, the “bite” missing from the Sun plainly visible. I knew about the eclipse of course, but I had dismissed the notion of looking for it. I understood that it would be seen further west, and thought that any views here would not be not worth the effort. I was wrong, of course. The universe offers up all sorts of delights and the rare events such as this partial annular eclipse should not be ignored. The effort is almost always worth it. Almost immediately the clouds closed in again, and there would be no birds found in a long walk up the valley. But birding isn’t always about what we go out looking for, the bird we seek. Often it is about what we find on our way there. Awesome Clare. I’ll expect to see it within two weeks. 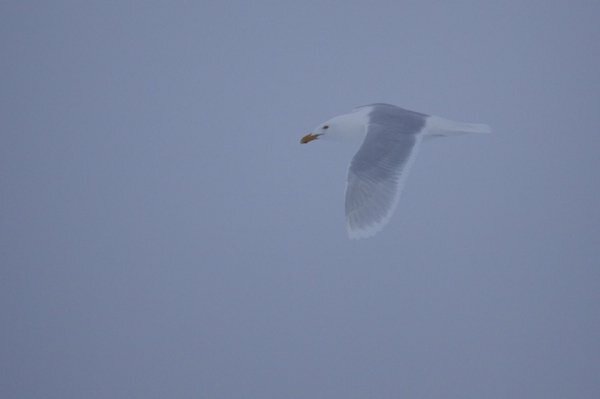 Who needs good light when you can get wonderful moody pictures like that Glaucous Gull. That’s one heck of a summer you are having there! Thanks Redgannet. It is a photo that can get away with a little bit more at the lower resolutions on the web. Best time of the year, 24 hour light, still travel on the ice, the birds beginning to return.